If your Estate value was $500,000 after-tax, you might assume to distribute that between your three children, giving them $167,000 each for their own use. However, if you were embrace the Child called Charity concept, it's as though you added another child to your family. 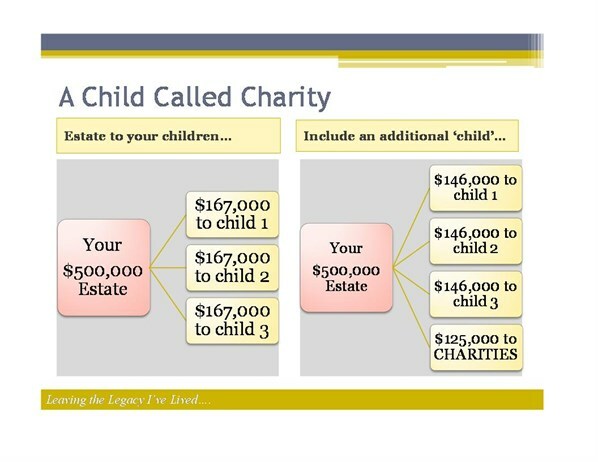 Instead of your Estate being divided between three children, it would be divided amongst four, giving them each $125,000. Then each of your children can also share in the tax credit that results from the donation receipt of this gift, giving each of them an additional $21,000 afterwards. So for a very small reduction in inheritance for your children, you have generously supported the charities and ministries that are important to you. 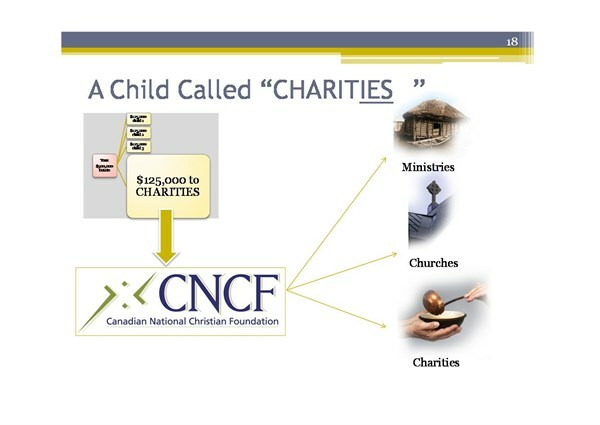 This process can be made even simpler by naming a public foundation such as the Canadian National Christian Foundation specifically as the 'child called charity'. By leaving a Letter of Direction with them, when the distribution from your Estate is received by them, they will distribute your gift to the charities you have chosen in the percentage or amount you desire. The other option is that you may wish to establish a Legacy Fund with your assets, offering your charities a perpetual annual gift.